A familiar garden weed, cleavers is found throughout Europe and northern and western Asia and is rich in plant chlorophyll. In China, the whole plant is sometimes eaten as a vegetable. It has been used in cancer treatments since ancient times, although its efficacy has not been confirmed by modern research. It is, however, highly regarded as one of the premier spring tonics, promoting lymphatic drainage and purifying the blood. The herb is used for treating urinary tract infection and its main symptoms - painful or difficult urination; also used in treating urinary stone, kidney inflammation and prostatitis. 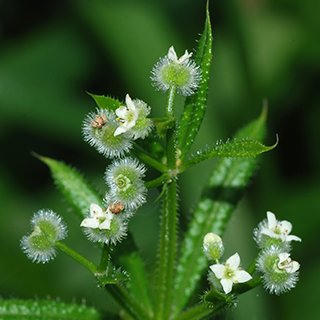 Cleavers in a strong diuretic and also cools and shrinks inflamed tissues or the urinary tract. The herb helps rid the system of metabolic waste and is therefore useful in treating any illness attended by swollen glands, including tonsillitis and ear ache. Take 2 tsp (10ml) of freshly made juice up to 3 times daily as a lymphatic cleanser and diuretic for conditions such as glandular fever, tonsillitis, and prostate disorders. Use frequently for psoriasis; it is most effective if treatment begins early when the skin patches are still small. Drink 1 cup (2–3 tsp herb per cup boiling water) of the fresh herb 3 times daily for urinary problems such as cystitis and stones in the urinary tract. Usually combined with other urinary remedies such as yarrow, marshmallow, or buchu (Agathosma spp.). Take up to 1 tsp (5ml) 3 times daily as a lymphatic cleanser and detoxifier for any enlargement of the lymph nodes. Apply a pad soaked in a standard infusion to scrapes, skin ulcers, and inflammations. It is easy to thoroughly mash the leaves and stems of cleavers, making an excellent cooling and healing poultice for treating poison oak and ivy, open soars, blisters and burns. Make infused herbal oil of the dried areal parts of the plant. May help reduce swollen glands, remove nodular growths on the skin, and shrink tumors - both benign and cancerous. Regarded by most gardeners as an irritating annual weed, cleavers climbs by means of hooked bristles through shrubs to reach heights of 4ft (1.2m), and spreads to 10ft (3m). It is not a plant many would choose to cultivate, as it usually grows anywhere and everywhere, but the bristly fruits that appear in autumn can be collected and immediately scattered where the plant is to grow the following year. Best gathered in the spring just before flowering.